There’s plenty of reason that the idea of a knight in shining armor has endured through the centuries. Even though military technology has replaced old-school metal armor with more effective technological solutions, and modern-day knighthoods are more likely to be handed out for recording some hit singles than for slaying a ferocious dragon, the old image still carries a lot of romantic weight. Speaking of weight, that’s just one of the reasons that it’s probably for the best that we don’t regularly rock suits of armor in this day and age. That stuff is heavy! Sure, it might save your life on the field of battle, but you’re going to pay the price with aches and pains for days afterward. Also, you know how modern activewear is designed to wick away sweat and cool you down during workouts? Yeah, that isn’t the case when you’re encased head to toe in sculpted metal. Ever touch a car that’s been parked in the sun all afternoon? You get the idea. So while the romantic notions of knights might not hold up, nowadays we have the technology to give you all of the cool appearance with none of the awkward drawbacks. 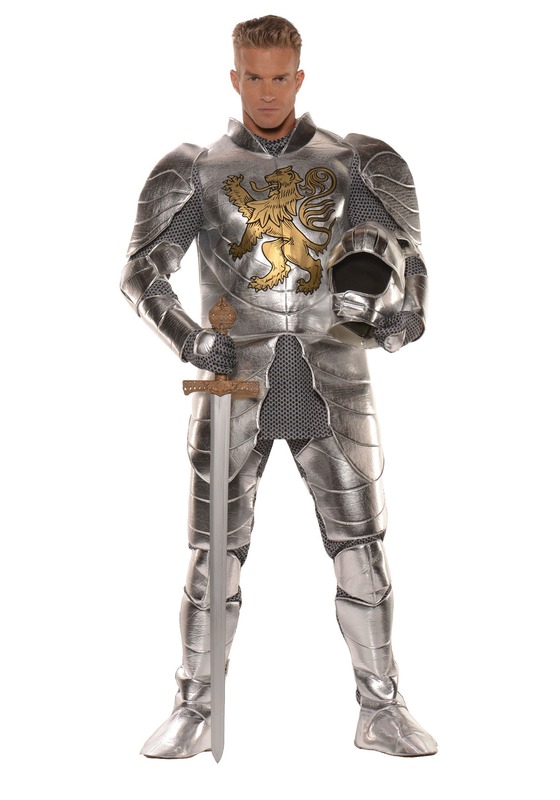 This polyester suit of armor is a big step up in the comfort department, featuring a tunic, pants and gloves with chain mail print fabric, and foam armor pieces covering your chest, back, arms, legs and feet. The all-important foam helmet fits snugly on your head, allowing you to look every inch the knight in shining armor without waking up sore the next morning.